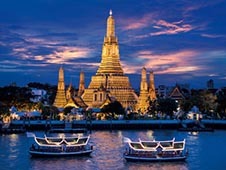 Bangkok – not only a city with a rich history and is the capital of Thailand, no. Today this city is a rapidly growing financial and cultural capital of Asia. Here there are more than 6 million people, and this number is constantly increasing. City terrific economic opportunities, Bangkok attracts the eyes of businessmen from around the world. This Hong Kong and Singapore accounts for a little cramped. In Bangkok there, what to see. Skyscrapers are interspersed with old buildings and ancient Buddhist temples of indescribable beauty. Also here is valid Planetarium for 450 people, and a variety of dishes will surprise even the most demanding travelers. In such a big city the best option to move – the car. The most convenient option – to rent a car directly at the airport Suvarnabhumi. It is far enough away from Bangkok. Therefore, to get acquainted with the local transport, you can book a car in advance. Usually, when renting a car at the airport the cost will be higher. Save money and know that you will wait for the machine to all selected characteristics will search through the site bokingcar.ru. In Bangkok, drive on the left, so you should drive carefully. The roads are very clogged traffic jams occur. To rent a car, the driver needs to have the right international standard. There may also ask about the age and driving experience - each company rolled their demands. Try not to travel during peak congestion - from 7 to 10 am and from 16 to 19 o'clock. By the rules of parking in Bangkok are very seriously. Seats can sometimes be missed, while looking for space to free parking near restaurants and shopping centers. There are indoor and outdoor paid parking. They cost an average of 0.7-2 dollars per hour. Under prohibition sign and the territory marked white and red lines, you can not park your car. Many parking areas cease to be in odd or even dates. Look carefully for signs - almost all of them are duplicated in English. In Bangkok, the least violations: high fines, police picky. The roads are everywhere patrols and radars that control speed. So here is a little break. Major penalties: nepristёgnuty belt, driving on the wrong side, a turn in the wrong place. The average fine - 500 baht. Nepristёgnuty belt and improper parking - 400 baht. Lack of registration certificate - 600 baht. The right to collect and return immediately after the payment of a fine at the nearest police station. For drinking and driving are very strict. The minimum penalty - 2 days in prison (awaiting trial) and a fine of 20,000 baht. The maximum - life imprisonment. Although corruption in Thailand is booming in this case agree with the law enforcement officers will not. Therefore, exceed the rate of 0.5 ppm is not recommended. Around Bangkok, many paid private road, and all have free analogue. The average fare varies from 2 to 5 USD. Basically you need to pay in cash at check-in Baht, but there are places where you can also pay by credit card. Payment is accepted by the employee at the ticket office. We had a great time on the roads of Germany. We tested the famous avtobahns. For this purpose we rented quite prestigious cars. Moreover, we paid for the rental a very low price due to this resource. There were no problems at all.